"You can't change history, but you can learn from it." – part of a series of tweets on August 17 from President Trump regarding the movement to take down statues of Confederate leaders & our Founding Fathers who owned slaves. 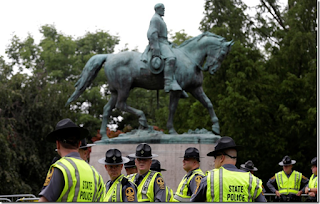 Democrats & centrist Republicans are having a field day with the statue issue because it is centered in political correctness & further hides the history lesson that the Democrat Party was the party of slavery, Black Codes, the Ku Klux Klan, segregation, & the Jim Crow laws that were in effect when many of the Confederate honoring statues were put in place. 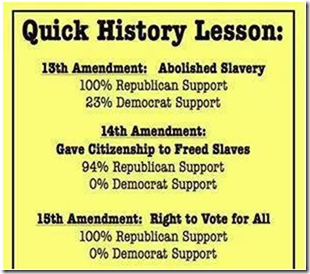 Note – The research I did on the subject agreed with the vote totals shown on the above graphic for the 13th Amendment & showed the 14th Amendment passed with 100% Republican support & the 15th Amendment passed with 96% Republican support. It also confirmed that no Democrat supported the 14th or 15th Amendments. 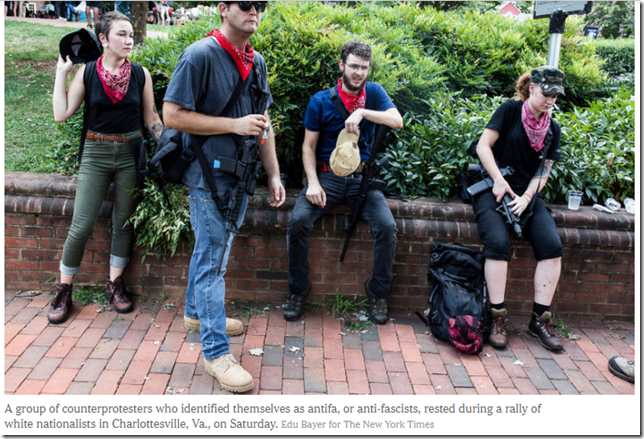 The disorder, chaos, & deadly violence in Charlottesville, Virginia last weekend was ostensibly about a permitted demonstration by battle-equipped White Supremacists (0.003% of the U.S. population) to protest the removal of a Robert E. Lee statue (see photo above) from Emancipation Park & counter protesters consisting of UVA students, local residents, & a group known as Antifa who showed up with baseball bats, tear gas, pepper spray, mace, & helmets. 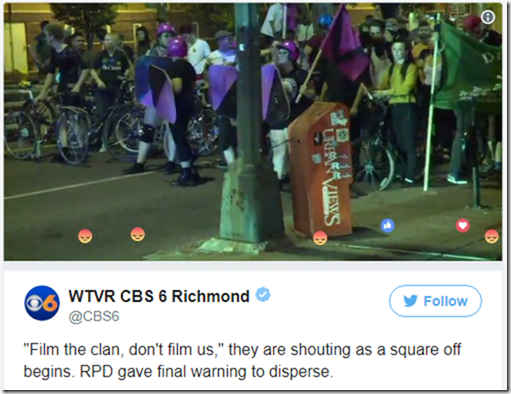 In short both sides were in Charlottesville for a fight. See photos below. 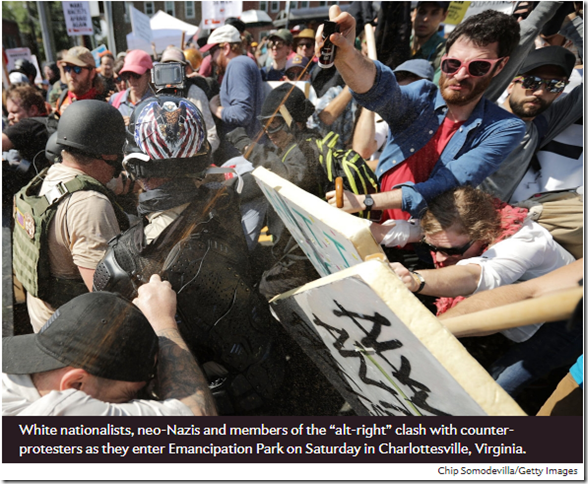 Don't waste time wondering whether or not the police stood down or whether you should side with the White Supremacists' First Amendment Right to protest, Antifa - the leftist militant group with roots traceable to the 1930s & more recently leading riots @ UC – Berkeley, the alt-Right, the alt-Left, George Soros, or the ACLU supporting the White Supremacists' constitutional rights. There is something much larger than the Charlottesville skirmish going on – namely all of the aforementioned principals have come together, wittingly or unwittingly, to make it easy for the many insidious enemies of America – statists such as BO, MO, Elizabeth Warren, Bernie Sanders, Nancy Pelosi, Chuck Schumer, Maxine Waters, Kamala Harris, the Castro Brothers of Texas, Al Sharpton, Ruth Bader Ginsburg, Sonia Sotomayor, the Clintons, & the hostile anti-American media - to undermine the nation's foundation by erasing our history & ultimately substituting a reinvented phony one – a dangerous idea. Just look @ the hidden history lesson provided @ the top of this post regarding Democrats' involvement in slavery – not generally known & being exploited today by Democrats convincing Blacks & centrists that Republicans are & always have been the problem. The statist enemies are working double time to get rid of Trump & constantly asking him if he disavows the White Supremacists is the latest tactic. 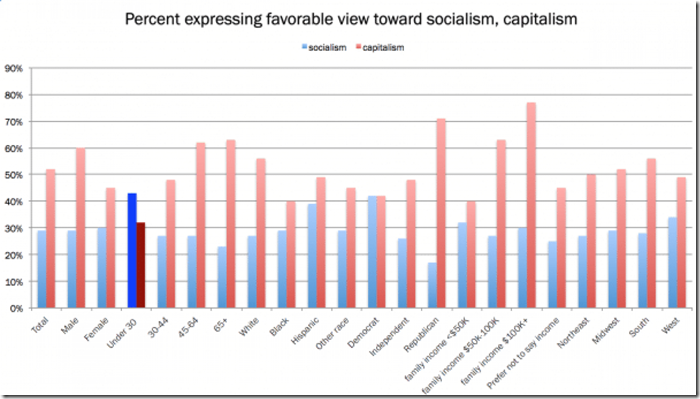 Thanks to Mark Dice for documenting Trump's disavowals going back 17 years – please note Bernie Sanders' non-disavowal response on the video to the same question asked during the primaries which of course did not raise an eyebrow of the hostile anti-American media. In fact it is hard to believe it was even brought up to Bernie other than the media was for Hillary @ the time. Touching the emotions of many Americans who watch or hear about two hateful groups confronting each other concerning whether or not Confederate statues should remain in public parks will naturally lead to similar confrontations regarding tearing down all references, images, statues, namesakes, memorials, monuments, & homes of the Founding Fathers who owned slaves. Specific projects already being mentioned include renaming the Washington Monument, removing a statue of George Washington in a Chicago park, defunding & removing the Jefferson Memorial, blowing up Mount Rushmore, replacing sculptures in Statuary Hall, tearing down a statue of TR in NYC, & removing Andrew Jackson's name & picture on the $20 bill. Not mentioned so far is the removal of any tributes to Democrat President Woodrow Wilson who was an open racist & as president resegregated the federal bureaucracy (source – Mark Levin, Rediscovering Americanism, page 55) or WV Democrat Senator Robert Byrd who had been a paid officer in the Ku Klux Klan with responsibility for recruiting new members. Indeed Emancipation Park, the location of the demonstration described in this post, was renamed two months ago after being known as Lee Park for 100 years. As older Americans die off, & since the ideas & principles of the founding of America are no longer taught in government schools, the removal of the aforementioned remembrances or closing down of Founder's homes & memorials will finish the job of erasing from memory what happened in 1776. 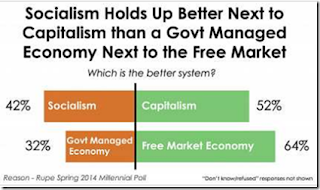 Our history can then be modernized by presenting in books & teaching in government schools what happened in 1937 - the year that statist Democrats believe the country was founded. 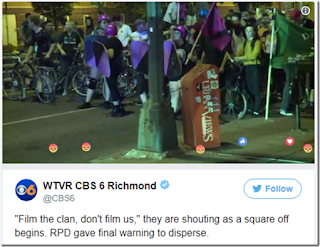 The notoriety of the racially charged Charlottesville demonstration, & probably many more like it to come before it's over, provides the perfect excuse for a politically correct society to destroy its history while simultaneously jeopardizing its future by being led by those who are only interested in making everyone dependent on government. Don't start on the slippery slope of Confederate statue removal because the statist Democrats will not be satisfied until they remove every trace of the libertarians who shaped our history & gave all of us the freedom we have today. The purpose of this post is captured by former Secretary of State Condoleezza Rice & former NBA star Charles Barkley – two people who could not be more unalike except they both clearly see the story of America as described in the referenced post, why we don't want to wipe out our history to make us feel better, & what great things we should do to make our futures better. 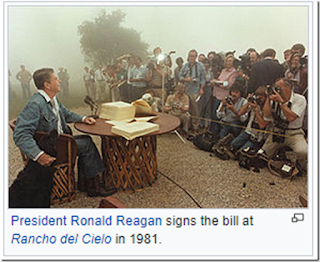 During the first week of August, 1981 Congress passed the Economic Recovery Tax Act of 1981 & presented it to President Reagan on August 12 who signed both it & the Omnibus Budget Reconciliation Act of 1981 into law on August 13. Below is the famous photo of the signing ceremony @ Reagan's ranch in California in front of reporters with his dog Millie @ his side. At the time Reagan was so happy @ the prospect for advancement & economic growth for the nation that I remember him saying on TV that "after the events of yesterday I don't know who is happier Prince Charles or me" – Prince Charles had just married Lady Diana Spencer on July 29. Both bills were passed with bipartisan support: 282 to 95 in the Democrat controlled House for the tax bill & 232 to 193 for the budget bill; the vote for the tax bill was by Voice Vote in the Republican controlled Senate so no record of individual votes was made & the budget bill passed 80 to 14. Trump does not enjoy the same type of legislative cooperation & happiness @ this same August point in his presidency. The Senate adjourned for summer recess on Thursday without repealing ObamaCare, with no plan to reform the tax code, no legislation to fund the government beyond September 30, & no plan whether or not to raise the debt ceiling that will be reached in September. The aforementioned 1981 tax & budget bills were based on Reagan's 1980 campaign priorities to rejuvenate the then lackluster American economy – principally income tax rate cuts & reductions in domestic spending & the size of government & its claims on earned income – many similarities with Trump's current tax & budget plans which have not even started the legislative process. To illustrate the increased prosperity & wealth creation the country may be missing by Congress's delay & inability to get to Trump's tax reform plan please consider the following graph comparing the quarter to quarter annualized real GDP change for Reagan's & BO's presidencies starting in the 3rd year of each presidency. But as we all know Congress has been bogged down in healthcare reform – the House went home for the August recess on July 29 & the Senate followed last Thursday after saying they would work until August 12. McCain left Washington on July 28 &, after undergoing treatment for brain cancer, will supposedly return in September when the Senate reconvenes. Without McCain Republicans don't have enough votes to reopen debate on healthcare reform even if they wanted to which, other than Trump, they don't. See graphic below that shows the tabulation of 13 key senators who voted "No" – some for good reason - @ least once along the way regarding passing a bill that would unwind or start to unwind ObamaCare. 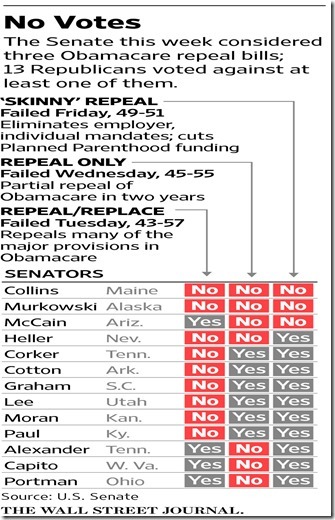 The "No" votes in all three columns for Collins & Murkowski indicate they are for keeping ObamaCare. The "No" votes in the first column for Corker, Cotton, Graham, Lee, Moran, & Paul indicate they are for repeal-only or keeping the discussion alive by voting for the skinny-repeal. Heller is for keeping the issue alive. 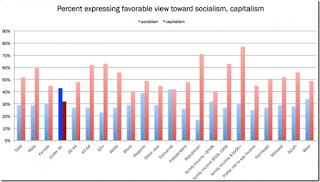 The "Yes" vote in the first column for McCain, Alexander, Capito, & Portman indicates they want to replace Democrat control of your healthcare with Republican control of your healthcare. 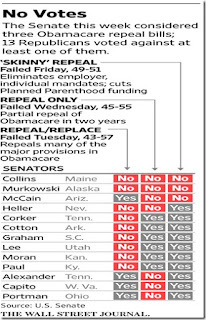 Six senators in the second column, not including Collins, voted "No" for the repeal-only alternative after voting "Yes" to repeal ObamaCare in January 2016 – these are the senators who betrayed their electorates with their January 2016 vote when they knew BO would veto any such repeal bill. Collins voted "No" in January 2016 so she is not one of the betrayers @ least on this issue. Collins, Murkowski, & McCain cast the three "No" votes, shown in column 3, that killed any healthcare reform @ all for the foreseeable future unless Trump forces another vote – see below. Pence broke a 50 – 50 tie after Collins & Murkowski voted "No" on the procedural vote to allow debate in the Senate to even begin. Without the 51 – 50 vote to proceed the three alternatives shown in the above graphic would never have taken place thereby shutting the healthcare reform debate down without a whimper after seven years of bluster. It is important to remember that in 2016 the Republicans did not win the Senate – they held the Senate while losing two seats from their previous 54 to 46 majority. 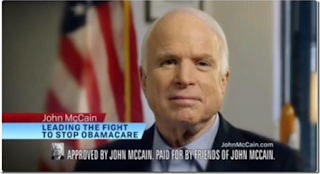 When it was announced in the middle of July that McCain underwent surgery to remove a blood clot over his left eye McConnell acted like McCain was such a hero that there would be no Senate healthcare vote "without John McCain being present" – this sounded overly praiseworthy to me when I first heard it. Come to find out McConnell knew that without McCain the Republicans would lose any vote 50 to 49 – McConnell needed McCain as a "Yes" vote to have a 50 – 50 tie for Pence to break. Then to make matters worse Trump made the following tweet. A strong case can be made that McCain got satisfaction voting "No" because the Tea Party members of the Senate, who he had previously called "whacko birds", wanted a clean repeal bill & of course nothing but ill feelings could exist regarding Trump for his comments about McCain's POW captivity. Both McConnell & Trump had plenty of reason to believe that McCain would have been a "Yes" vote. See campaign poster below from McCain's 2016 Arizona Senate race. There was plenty of outrage in the aftermath of the Senate's miserable failure to fulfill a campaign promise to repeal ObamaCare - made over seven years & four consecutive election cycles. My favorite outrages involved the voters who do not know, & have not made it their business to know, the people who have control of their lives & their healthcare who said "we'll have to vote them out the next election". Collins term does not expire until 2020 & Murkowski's & McCain's not until 2022 so their next election is not in the near future. Collins, who says she did not vote for Trump, won her 2014 election with 68% of the vote & when she returned to Maine after the final healthcare vote she was met with applause @ the airport so she has no reason to change her ways. But Trump does not take losing easily & he has two ways to force Congress to repeal ObamaCare. First – Government payments to the insurance companies as reimbursement for the so-called cost-sharing subsidies are not permanent appropriations - meaning that Congress in effect lets cost-sharing subsidies lapse if they do not make an annual appropriation. In fact Congress has not authorized cost-sharing funds since 2014. Accordingly, Trump is not authorized to make these cost-sharing payments – the next one is due later this month. Cost sharing is a term used to cover out of pocket healthcare insurance costs such as deductibles, co-payments, & co-insurance. Cost sharing expenses are made directly to insurance companies while the subsidies that reduce ObamaCare premiums are made directly to the insured in the form of reimbursable tax credits. About 85% of people who buy ObamaCare on the exchanges qualify for subsidies that reduce premiums & nearly 60% of them have low enough incomes (below 250% of the federal poverty level) to qualify for cost sharing. It is the other 15% of people who buy ObamaCare on the exchanges who get no financial help in paying premiums or medical expenses – these are the people you hear about that are hard pressed to meet the major ObamaCare insurance costs – premiums & deductibles. People above the 250% federal poverty level but below 400% get some relief in paying premiums but no help with deductibles. Healthcare costs are relatively small or nonexistent for people who qualify for cost sharing or Medicaid under ObamaCare. Now Trump is constitutionally correct to require Congress to either authorize the cost-sharing subsidies or repeal ObamaCare – both being subject to his veto. Pointing out that cost-sharing payments cannot be made to all the people described above gives a large incentive for Congress to act. The House initiated a lawsuit against BO's White House for usurping Congress's constitutional power of the purse when BO made cost-sharing subsidy payments without proper appropriation authority from Congress. A federal judge ruled in the House's favor but allowed the cost-sharing subsidies to continue while the litigation continues - the case is under appeal but being stayed while healthcare reform is being debated in Congress. Nevertheless, Trump made his own oath to support the Constitution so no matter what the court system does or decides on this clear case Trump should withhold cost-sharing subsidy payments until Congress rectifies the situation. Some insurers have based their premiums for 2018 on the assumption that cost sharing subsidies will continue – without them they will either pull out of some markets or raise premiums accordingly – further abusing those who don't get premium help while leaving those who do only marginally affected. Second – Heather Higgins recently reminded us that Members of Congress & their employees have been playing loose with the rules regarding their own healthcare insurance coverage. Specifically, ObamaCare originally required members of Congress & their employees to buy healthcare insurance coverage under the ObamaCare exchanges meaning these people relinquished their generous plans under the Federal Employees Health Benefit Program. But not so fast – this meant congressmen & senators would suddenly be required to pay most if not all of their healthcare insurance costs – premiums & deductibles - & many of their employees would move to inferior plans @ added cost making their employment not as attractive as before. Some congressional staffers could suffer the indignity of being thrown onto Medicaid – not a good image. To spare themselves a self-serving embarrassing vote that would have highlighted their problem Congress & their employees appealed to BO who worked a deal with the Office of Personnel Management (OPM) – who had no legal authority regarding the matter. 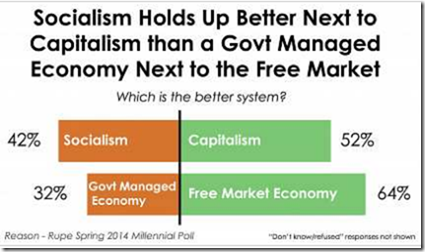 OPM approved the whopper that both the House & Senate are small businesses with each having less than 50 employees. Accordingly, the staffers were exempted from ObamaCare & stayed on their old healthcare insurance plans & members of Congress & designated official office staff have been covered through the District of Columbia's small business exchange – where they receive a special government subsidy from their employer (tax payers) of up to $12,000 per year. Trump can right this deceitful contemptible abuse by instructing OPM to end the subsidies for Congress & their office staffs & the exemption for their employees. Trump knows of the ObamaCare bailout abuses, & now we know that he knows. Trump can use this information as leverage to get Congress to pass legislation repealing ObamaCare that is suitable for him to sign into law – if successful this solves the original problem @ hand. But one way or another Trump has to end these two ObamaCare bailout abuses because there is no surer way to honor another campaign pledge – namely to drain this portion of the Washington swamp.